RISE and FALL of the SANCTUM SANCTORUM of DR. STRANGE. 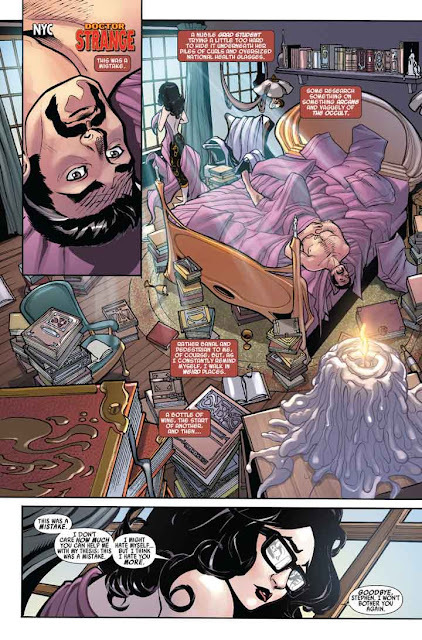 As was the case when I began this series, while the actual post is all about the Sanctum Sanctorum of Doctor Strange, and the many times it has been destroyed and rebuilt - like when I first started this series, this entry is also inspired by my real-life "Sanctum Sanctorum"; in my home. Actually this very post was actually (mostly) written over a year ago (Sept. 2010), but never posted, as many of you may know from reading the posts around that time, I was undergoing a relocation and was moving to a new "Sanctum", thus my old one was being boxed up and the overall look and feel of the place was one of "tearing down". Well, after moving most of our belongings to the new place, we were informed that due to emerging circumstances with the land-owner, that it was no longer going to be available - and I had to move all of that stuff BACK. Since then, there were instances where I had to dismantle what little was left standing (like during the Hurricane Irene storms) to prevent any possible breakage that might arise. I've only recently begun to rebuild rooms and areas of their spartan furnishings and effects. 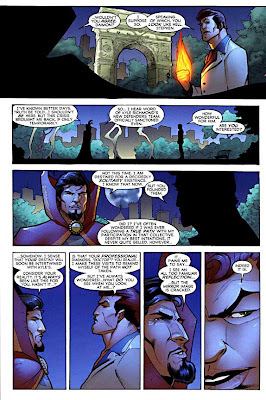 And so, it made me think upon the state of Doctor Strange and his Sanctum Sanctorum after the events where he recently destroyed his Sanctum and left - to find himself (those events seen in New Avengers Annual # 2 - and showcased in PART VI in this series - found [HERE]. After Dr. Strange laid waste to his sanctum, he wandered around a bit, doing what he could to reconnect himself to the realms of "white" magic. 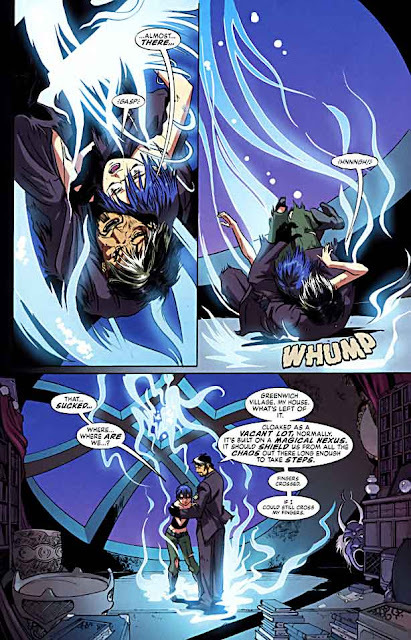 Without a specific base of operations, as the Sanctum would be undoubtedly under constant watch by government agencies and Initiative task forces, and not wishing (or being able) to waste energies mystically hiding from sight there anymore, Strange would always just seem to appear at places where magic was going awry and/or people needed him. Getting in touch with "green" magic. 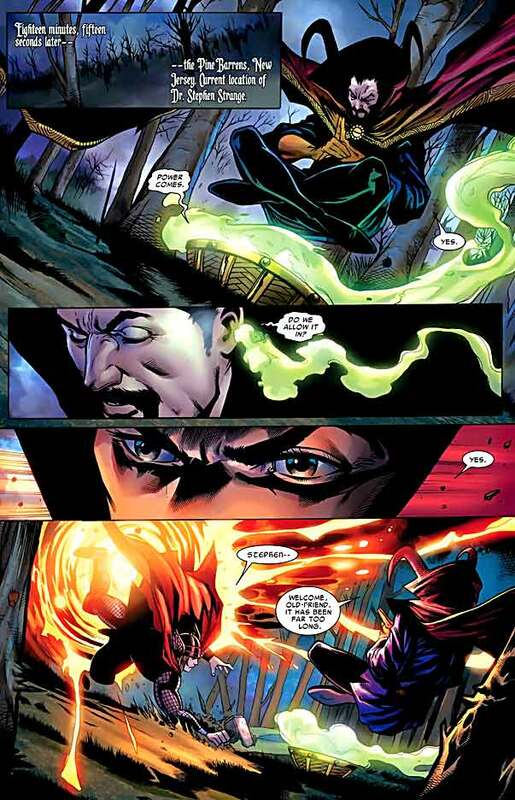 ...Strange was out and about trying to find his center once again. Perhaps, that is why when called by Spider-Man, who was in need of mystical aid against the Cytorrak-empowered Juggernaut, Strange was "unavailable" - again (Amazing Spider-Man # 627). 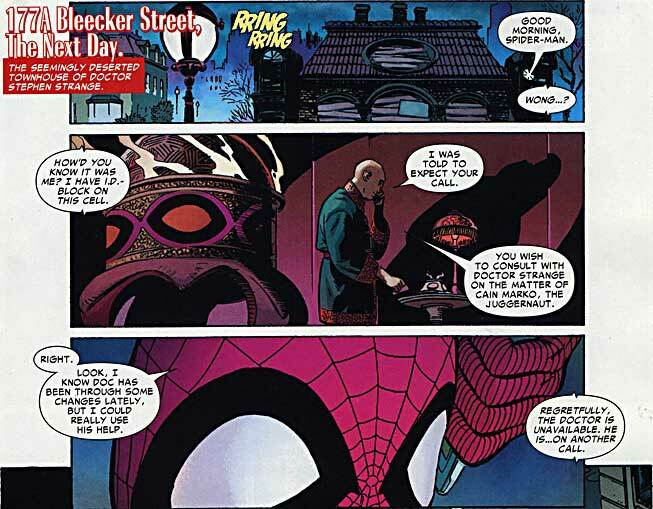 Once again, exactly like Amazing Spider-Man # 228 (1982) Spidey only gets Wong - as Doc is "busy". 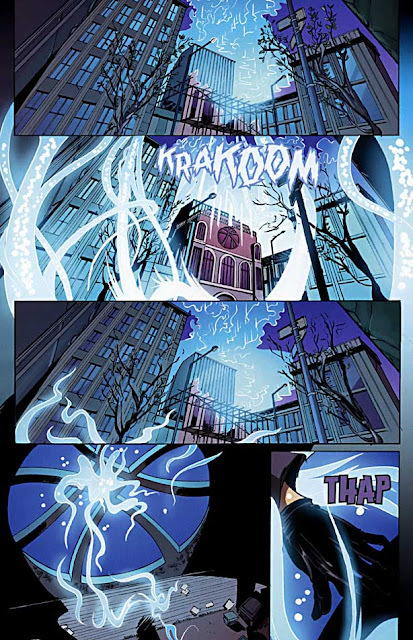 In that issue, the Sanctum is shown looking much like it did during New Avengers Annual # 2, wrecked, ruined and boarded up. 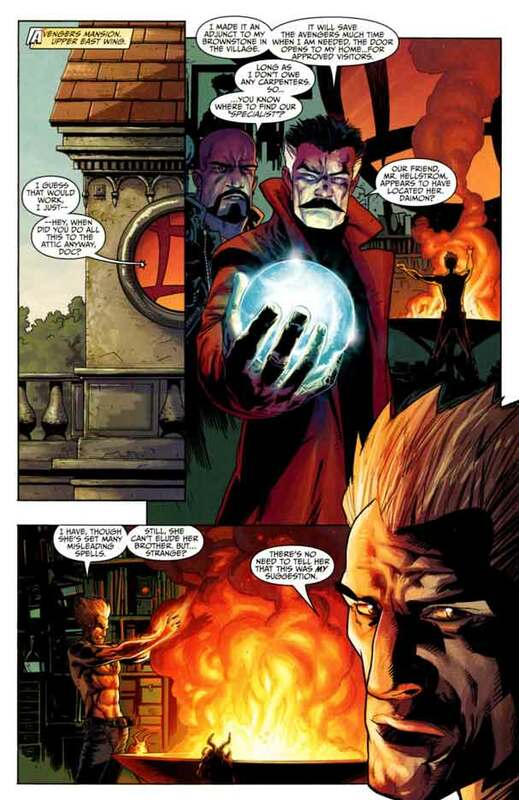 While this Spider-Man issue shipped later in the year than the next appearance that I'll be presenting, I believe it was meant to take place sooner, as in the next instance (Strange v2 # 4), after Doc abdicated his role as Sorcerer Supreme and losing the Eye of Agamotto along with it. Appearing intact from the outside, but only when made to appear at all (as it is under a spell of concealment over an abandoned lot - much like back during the days of the "Midnight Sons" - as seen in Part V of this series [HERE]), the Sanctum is now fairly fixed up from the outside - while the inside is more of a "work-in-progress". 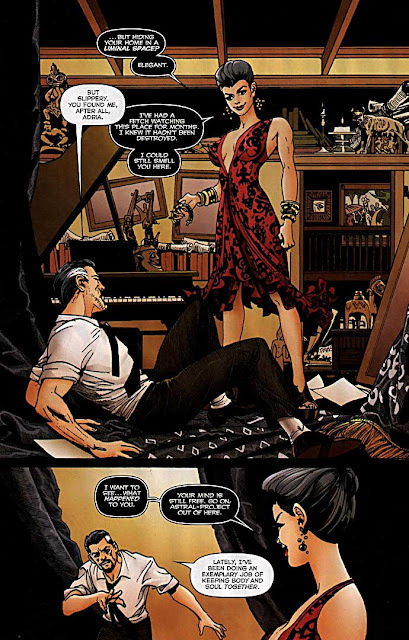 The story that followed on the heels of this mini reveals that the Sanctum was still magically hidden, but that now the interior of the Sanctum was looking more "up to code" and quite livable. 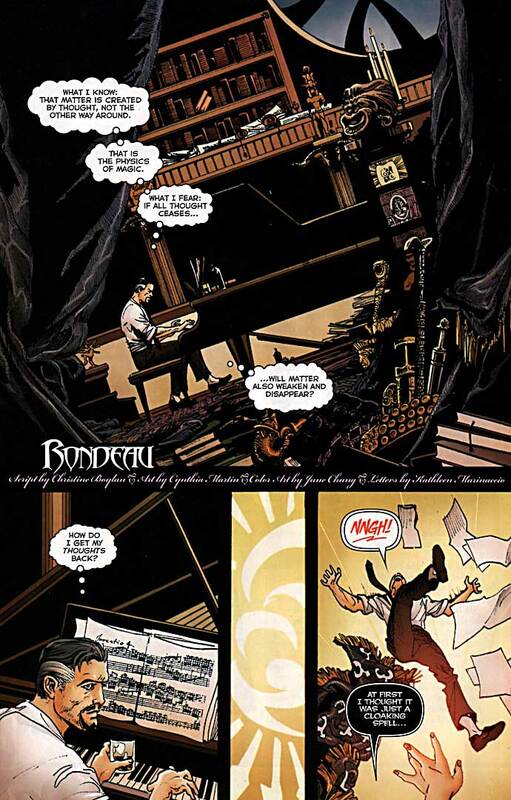 This scene from a tale entitled "Rondeau" (from Girl Comics # 2 - with an in-depth review found [HERE]) sets the stage for a Sanctum and Sorcerer - on the mend. 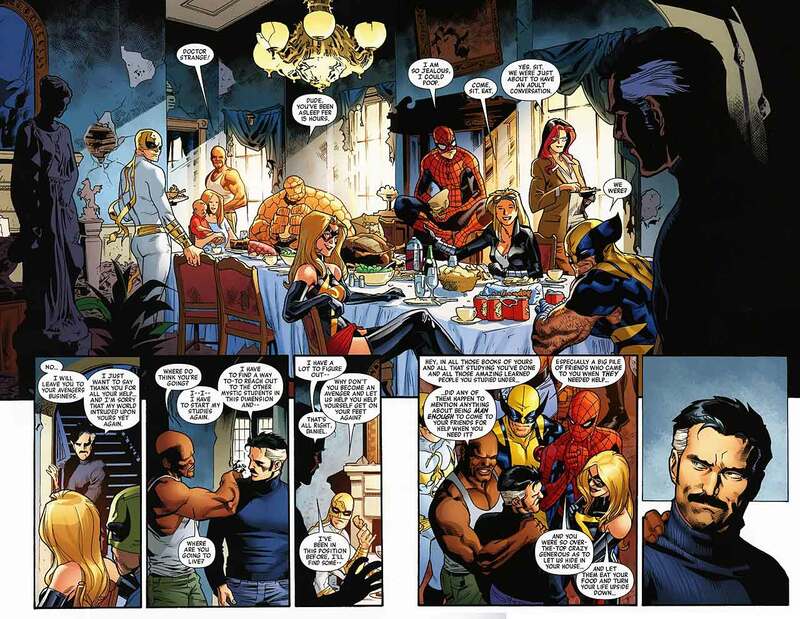 In Thunderbolts # 155, Jeff Parker starts the issue off strongly... and not just a bit "strangely" by immediately rectifying a glaring mistake made by Brian "I don't read or care what came before, I just make 'em up as I go along" Bendis, over in the New Avengers. In recent issues of New Avengers, Bendis had Dr. 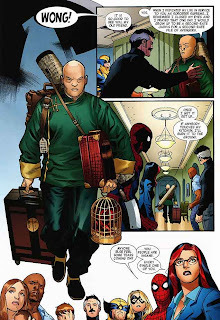 Strange (and Strange's manservant/assistant/acolyte; Wong) move into Avengers mansion, because (Bendis believes) Strange's Sanctum Sanctorum is uninhabitable - despite several issues of other titles' showing Doc and/or Wong actually fixing up the place, as shown in the examples above. 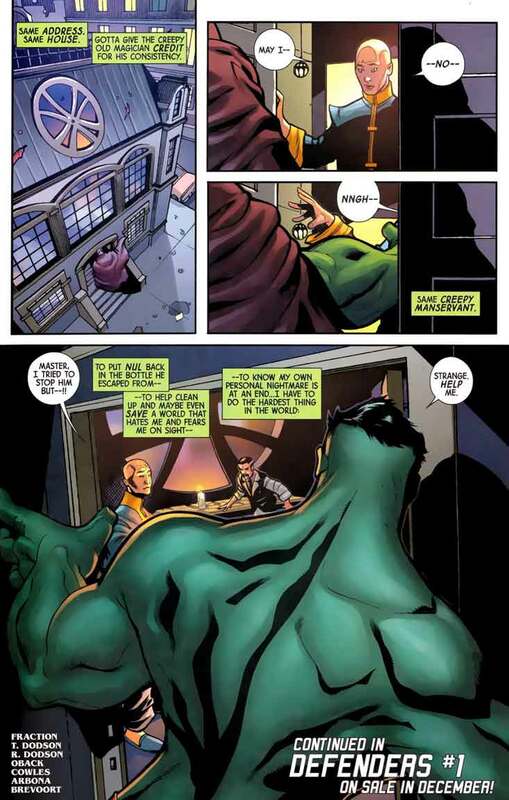 However, Jeff Parker puts that mistake to bed by explaining that Doc has set up a mystical doorway from his Avengers Mansion attic-space to his Sanctum-proper - for anyone worthy of admittance. More recently, it has been re-established that Doctor Strange resides in his Sanctum Sanctorum, especially as he is now a part of a reborn team of DEFENDERS. 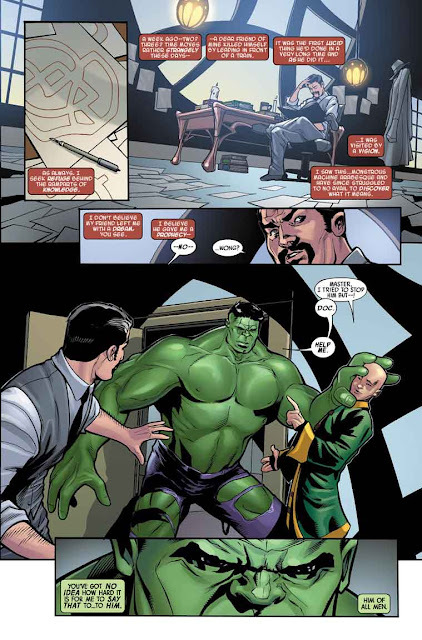 To this end we see the Hulk seek out Strange's aid, first in the 2nd epilogue of 'Fear Itself' # 7 (which also acts as a prologue to the new Defenders series). Gotta give the creepy old magician credit for his consistency." ...and then from the other side of the P.O.V. in 'The Defenders' (2012) # 1. Strange's Sanctum Sanctorum has been neater, but at least it is intact. 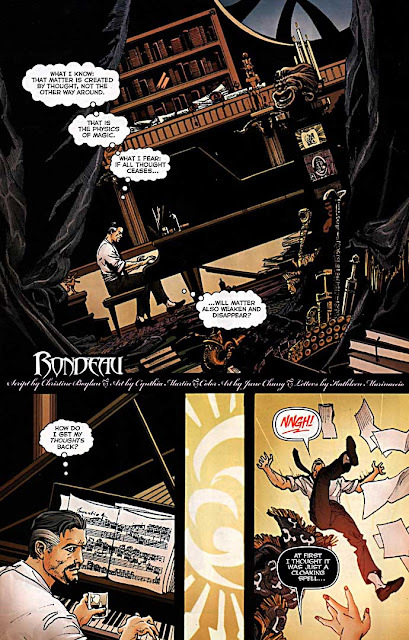 There is one other interior scene from the issue - Doc's bedroom - and it shows the fact that the house is not only habitable, but also sound enough to..."entertain guests". I won't get into it all again now. 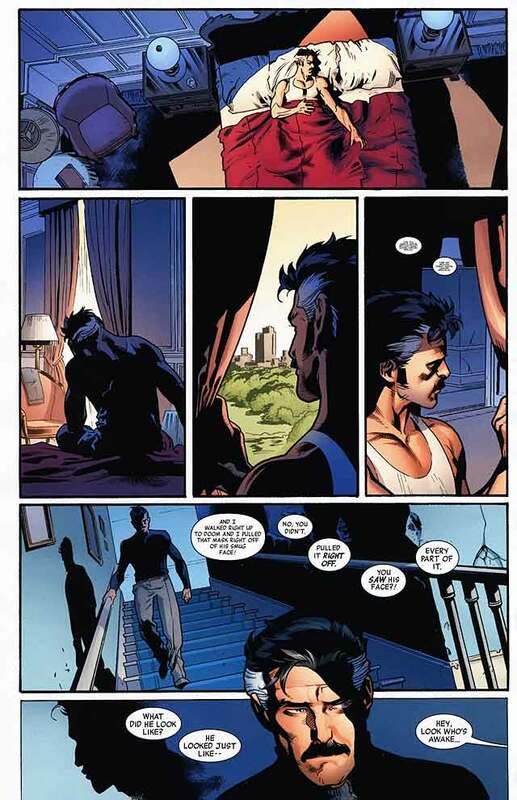 Seriously, go read my post on this scene [HERE] - and my review of the issue [HERE]. 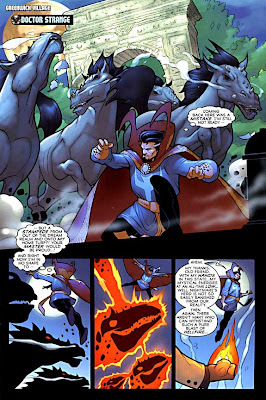 Sadly, while the Sanctum has been rebuilt, this scene - and the similarly poor treatment that has been shown to Doctor Strange - shows that Strange as a character is still in danger of being torn down. We can only hope that trend will change. By Defenders v4 # 4 the Sanctum is shown - inside and out - to be back to all it's former glory. And this brings us up to date on the multiple rises and falls of the Sanctum Sanctorum of Doctor Strange. If more examples present themselves (and they most certainly will), I will be sure to add them here - or in a new post in this series. - A look in the mirror before heading out.